This photograph is from a Pakistani wedding I had shot in June 2011 at the luxurious Ritz Carlton hotel in downtown Atlanta. Similar to Indian Weddings, Muslim weddings consist of multiple events. 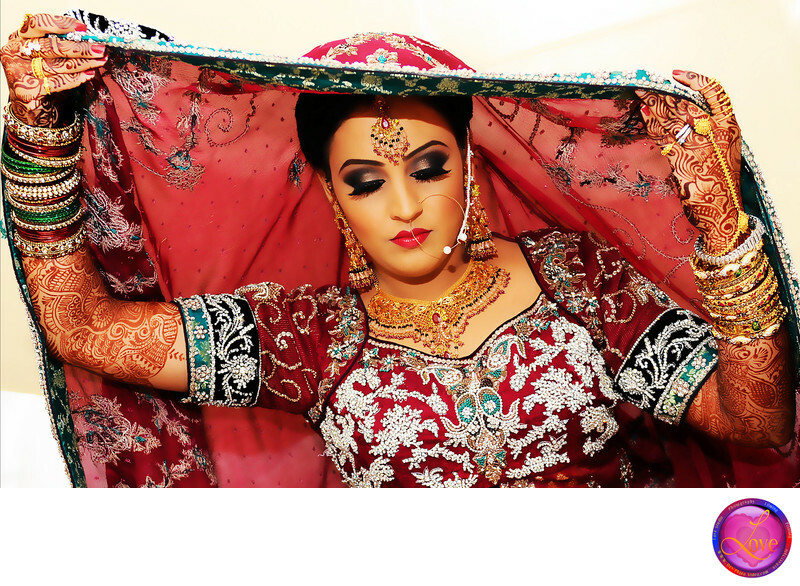 Most commonly celebrated events are Mehndi or Henna, Pithi or Haldi, Nikah and Walimah. Mehndi or Henna is the event in which the bride and all of her loved ones including mother, cousins, aunts, bridesmaids and all other female guests put henna tattoos on their hands and feet. It is a very colorful event, every photographers dream to photograph. The Mehndi ceremony usually occurs the day before the actual wedding. This vibrant event is distinguished in all south Asian weddings including Muslim, Hindu, Sikh and Jain. At the Walimah Reception, the bride’s makeup is done and it is time to take some live portraits. The idea behind this photograph is the Islamic heritage which is also an Indian inheritance. It is considered that the bride looks most beautiful when she is under the veil. Showing respect to the elders, audience, and as a sign of politeness the bride should look down. Now it is the photographer’s time to take pictures of the gorgeous bride in her stunning, vibrant outfit. Roohi Ali Dasthi was the makeup artist for the wedding. I am delighted to have worked with her and she is one of the best makeup artists I have worked with. I love this magnificent, ingenious photograph. A large canvas gallery wrap of this picture is hung on my studio wall. Location: Ritz Carlton Atlanta: 181 Peachtree St NE, Atlanta, GA 30303 Phone:(404) 659-0400.